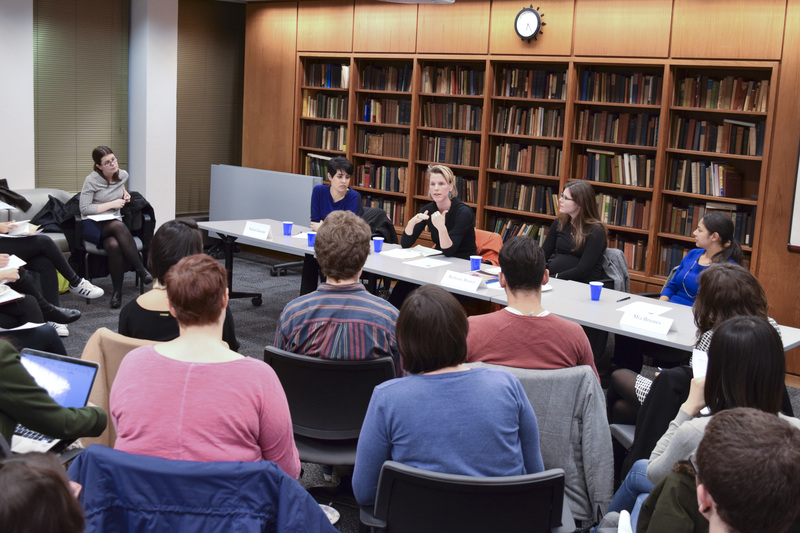 On November 14, the Weatherhead East Asian Institute at Columbia University hosted a lecture titled “Understanding the Rohingya Crisis.” Panelists addressed the historical roots of ongoing violent conflict in Myanmar, including the “othering” of the minority Rohingya Muslims and escalating fear of Islam, as well as the responsibility of the international community to respond to the country’s human rights crisis. The lack of response raises questions about the international community’s commitment to protecting peace and precipitates another interesting discussion: What does an ethnic cleansing overseen by a Nobel Peace Prize winner mean for the credibility of the award itself? 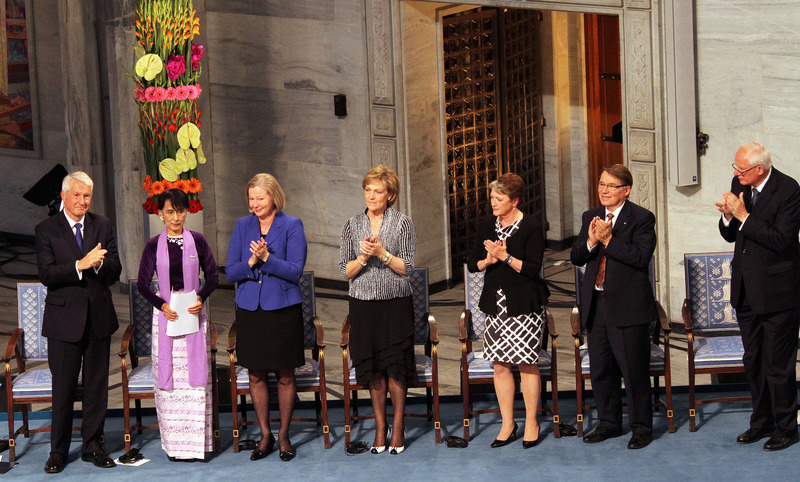 Daw Aung San Suu Kyi, Myanmar’s de facto leader and first state counselor, was conferred the Nobel Peace Prize in 1991 for her admirable fight for democracy in Myanmar during 15 years under house arrest as a political prisoner. However, actions speak louder than words. Aung San Suu Kyi’s complicity to the killings and expulsions of Rohingya Muslims raises questions about her promise to ensure peace and democracy in Myanmar. Panelists of the event provided context for the current crisis and cited startling statistics of pervasive and systematic violence against the Rohingya, violence that constitutes ethnic cleansing by U.N. standards. 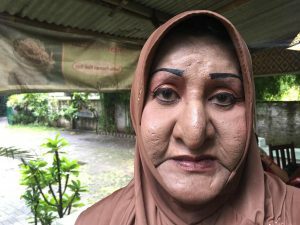 Human Rights Watch reports that military repression has resulted in the deaths of thousands of Rohingya Muslims, forcing at least 600,000 people to flee their homes since 2016. 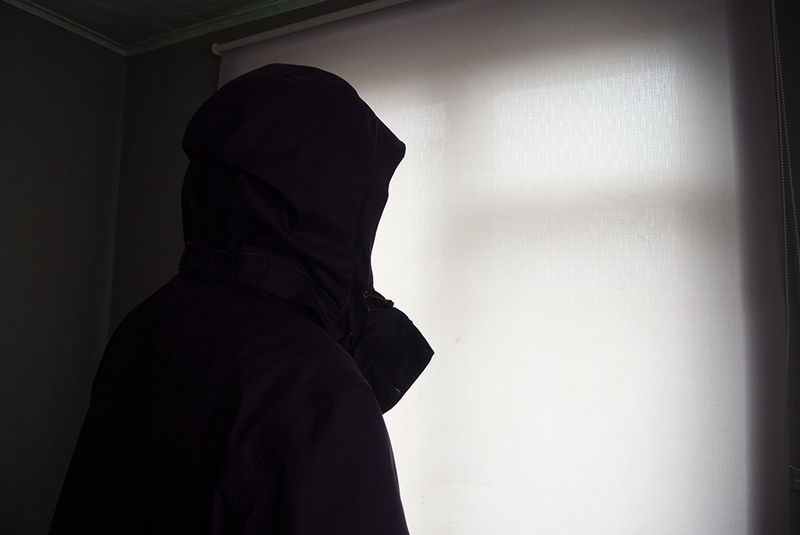 The U.N. continues to deliberate on whether the killings constitute a genocide. Furthermore, panelist Mayesha Alam mentioned that no state besides Indonesia criticized the government of Myanmar for its inhumane treatment of the Rohingya during the recent ASEAN summit. The lack of international response delegitimizes international covenants such as the Universal Declaration of Human Rights and principles such as the Responsibility to Protect. In her first public address since the violent military crackdown on the Rakhine state, Aung San Suu Kyi’s statements contradicted her actions. She displaced blame and denied culpability, claiming that the Myanmar government “condemns all human rights violations and unlawful violence.” She also made false claims, assuring the audience that Rohingya Muslims did not face discrimination and had equal access to healthcare and education— a blatant lie according to international human rights advocates. Perhaps more concerning, in the same speech, Aung San Suu Kyi announced that despite widespread condemnation, she does not fear international scrutiny. However, Stalsett’s above statement is dangerous— it insinuates that the Nobel Peace Prize committee has no interest in the actions of their awardees post-conferment. 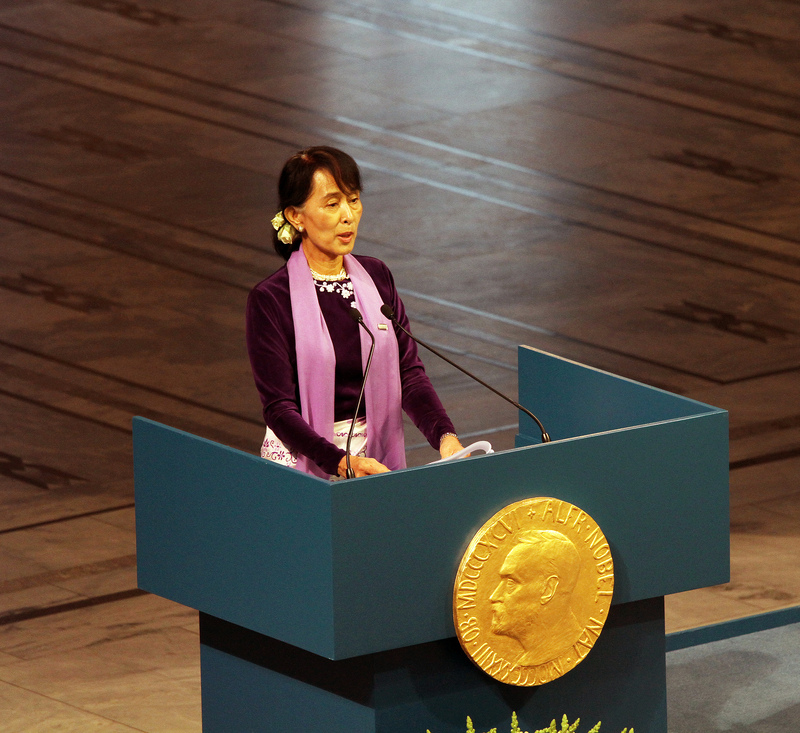 Not condemning Aung San Suu Kyi for her direct contradiction of the award’s values discredits the legitimacy of the prize. 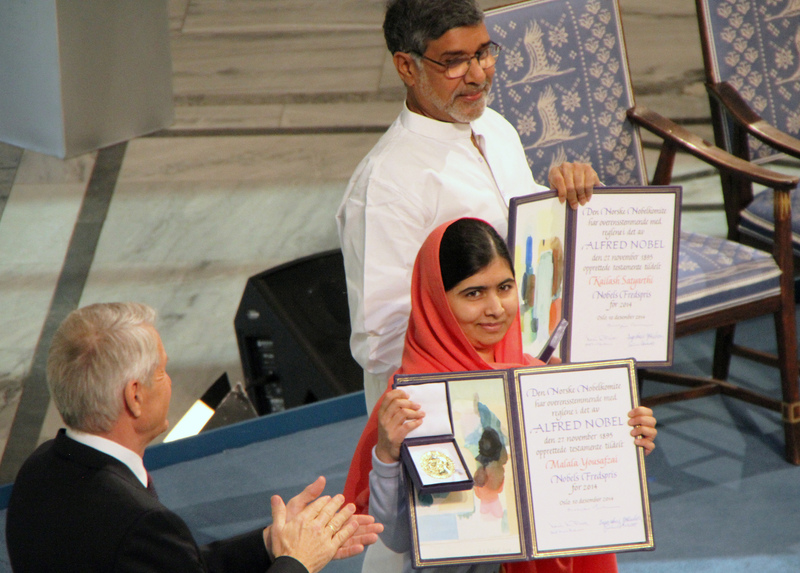 Recipients of the Nobel Peace Prize should be held to higher standards and accountable for their actions. At the least, they should face repercussions for committing injustices. While a Nobel Peace Prize has never been revoked, in this case, rescinding the award appears to be one of the more obvious and symbolic means of sending an important message to Aung San Suu Kyi: reputation and power do not acquit anyone of wrongdoing in the face of human rights violations. 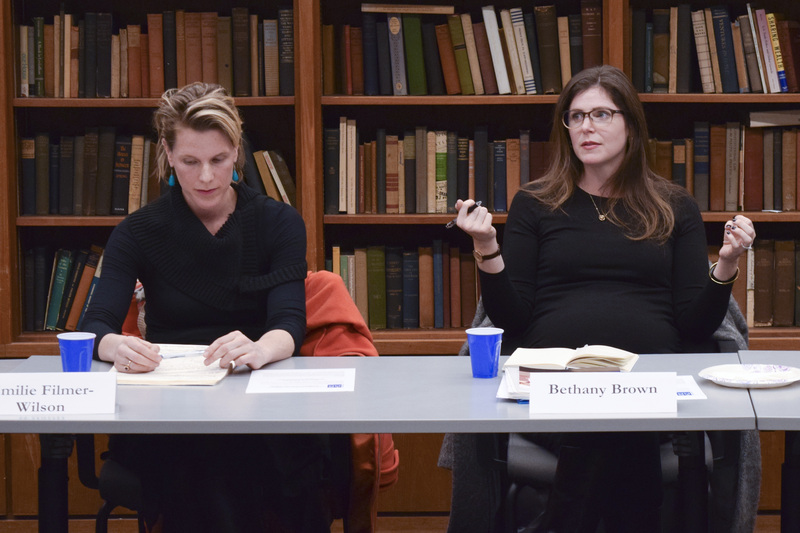 Amid a tense political climate and growing importance of the human rights field, the Institute for the Study of Human Rights annual Career Panel came at a particularly conducive time. On February 21st, an ensemble of undergraduate, graduate and prospective students gathered to discuss topics ranging from the professional opportunities available to human rights students to the skills, credentials, and experiences most valued by organizations. 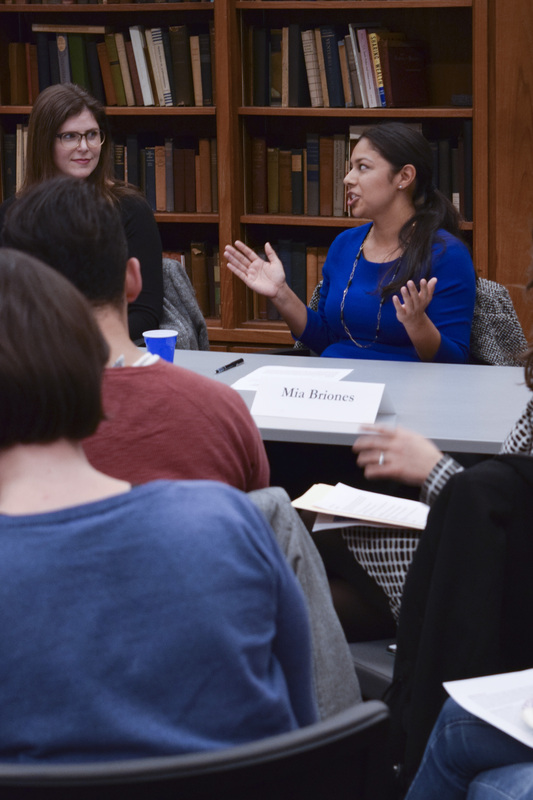 As acknowledged by faculty and students alike, human rights does not always present an obvious career path, which was why hearing from experts in diverse fields within this realm proved opportune. This year’s panel welcomed four experts working at intergovernmental organizations, NGOs and not-for-profit organizations: Mia Briones, a leadership gifts officer at the International Rescue Committee (IRC); Bethany Brown, a researcher at the Health and Human Rights Division at Human Rights Watch; Emilie Filmer-Wilson, a Global Human Rights adviser at the United Nations Population Fund (UNFPA); and Nahal Zamani, an advocacy Program Manager at the Center for Constitutional Rights (CCR). The panelists opened the discussion by describing their academic backgrounds and professional paths. Mia Briones’ role with the IRC’s major donors, for example, requires her to be completely up to date with international affairs, as was noted by Nahal Zamani from the Center for Constitutional Rights. Being knowledgeable about a wide range of issues around the world and able to provide commentary is crucial to her work. With information and international events moving as fast as they do, it is fundamental for professionals to engage with many actors —governmental, non-governmental, national and international, as well as civil society— to get a full grasp of the current footing of your field. With this in mind, every student or job applicant is expected to be alert to how their research or a particular organization is presented in the media. 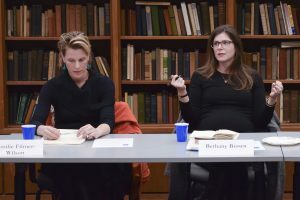 Following social media or official news outlets to better understand public opinions about the field or organization was highlighted throughout the panel. Oftentimes, in human rights advocacy and funding, it may be difficult to motivate or spark interest in a listener or reader— therein a full understanding and motivation in your work is indispensable to engage others. On this note, Bethany Brown added that networking should never be overlooked or overrated; she herself reaches out to other departments at Human Rights Watch to make sure she is fully abreast on certain topics. For many within the human rights field, working for the United Nations is a career goal. Emilie Filmer-Wilson, having worked at the development pillar of the UN for the last 11 years, offered some insight into the work environment and hiring competitiveness of the organization. While it is a state-centric organization, she reminded attendees that ‘’there is nothing like the UN in bringing stakeholders together.” The diverse backgrounds of UN employees make for an inspiring work environment for anyone with a passion for our global village. Moreover, it enables work-related international travel and missions, which are often of major interest to students. Another type of work environment students might find interesting is not-for-profits. Working at the CCR, Nahal Zamani finds it particularly fulfilling to be able to transfer the skills she acquired from a life of political activism to a professional setting. Against a growing competitive backdrop within human rights and international affairs, the panelists shared some insights on the attributes most sought by hiring managers. Excellent communicators, writers and researchers with direct work experience stood out among the hundreds of applicants reviewed, according to the panelists. In other words, while there must be an evident drive to work in a specific field, it is highly recommended to demonstrate how you have already engaged in the field. Tangible experience in adopting a certain mindset given the scope of work, as well as showing initiative or producing creative solutions to problems were all highlighted. For example, to work internationally, clear evidence of successful work with people or teams from different backgrounds is essential. Analytical skills matched with political judgment to identify how to present information depending on the audience also mustn’t be disregarded. There must be an underlying passion in one’s work, however never to a point that hinders one’s ability to see others’ perspectives. Such diplomatic skills are a valuable asset in cultivating change and engaging in discussion with various actors. It was particularly interesting to see the emphasis on the importance of a fortuitous opportunity made possible through hard work. All panelists reminded the audience that while hard work does lead to great opportunities, one should take advantage of lucky opportunities and invest hard work. Avid commitment was flagged as the key to converting opportunities into concrete achievements. It is important to know what you want, to put yourself out there, and to take the risk. There is nothing to learn from an opportunity not taken, but one can always learn from failure. A last topic worth highlighting was the panelists’ discussion on field work. While the majority of students look internationally, any work with affected communities constitutes field work. 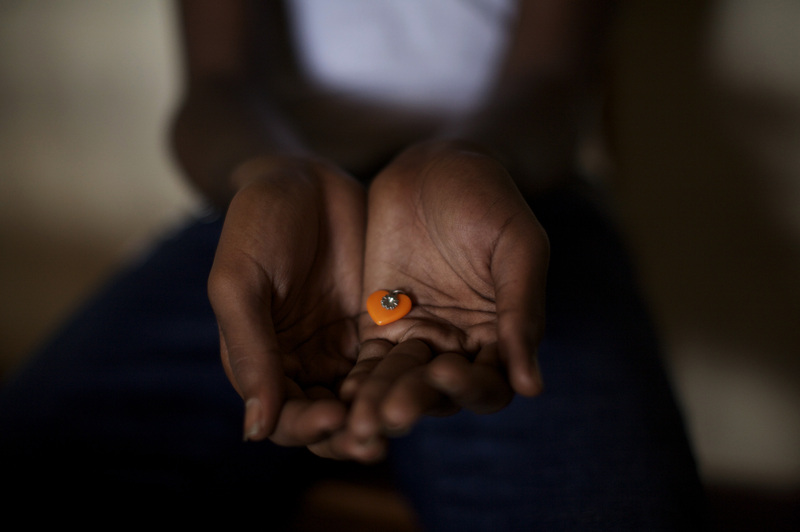 There are a myriad of human rights organizations in New York City that students are encouraged to explore, as well as opportunities to work with vulnerable populations such as refugees, the elderly or the homeless. In fact, Brown revealed she first became aware that she wanted to pursue a career in researching international frameworks for older people’s human rights after volunteering for a hospice in her hometown in her early 20s. There are sure to be more career-related events for the human rights aficionados around campus. Be sure to stay informed of opportunities and make sure to take advantage of each one. Bárbara Matias is an M.A. candidate at the Institute for the Study of Human Rights at Columbia University. Her research interests include refugee rights, forced displacement, and human rights affairs in the context of the European Union.